Dec 14, 2018 Xtend Elite Features 2g PeakO2 with New Research! Xtend Elite is the PeakO2-powered successor to Scivation Xtend Perform, which is an intra workout supplement with a serious endurance-boosting blend! Ketone & Adaptogenic Aerobic Optimizer! Enhances Mental Focus & Acuity Without Stimulants! Why is MPA KETOxygen different from all the other exogenous ketone supplements currently on the market? I uniquely designed MPA KETOxygen with not only the highest percentage of BHB salts on the market, but in combination with other all-star ingredients that promote endurance, mental clarity, neurogenesis, and uncanny “clean energy” while it’s in your blood doing its magic. I uniquely designed MPA KETOxygen with not only the highest percentage of BHB? salts on the market, but in combination with other all-star ingredients that promote endurance, mental clarity, neurogenesis, and uncanny “clean energy” while it’s in your blood doing its magic. I like to be accurate, judicious, and precise with my marketing approach so I do not make false promises and mislead the people that put trust in me. 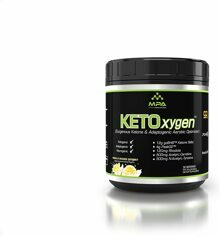 Exogenous ketones will not directly burn body fat or induce weight loss. Increase energy by supplying an additional fuel substrate that your body and brain can use immediately and readily. That in turn makes physical activity easier to endure, and mentally demanding activities easier to conquer. There has been research pointing to the fact that supplementing with exogenous ketones could increase your metabolic efficiency. This would equate to better output and stamina while mitigating the requirements for ATP to working muscles. There is also the benefit of exogenous ketones causing a satiating effect, making your hunger signal not as prominent. This will make harsh dieting phases much easier to tolerate and endure during times of famine. As you can gather--all of these effects listed above won’t DIRECTLY initiate fat-loss or a leaning effect, but INDIRECTLY influence the possibility of fat-loss by giving you more energy than you would have had without exogenous ketones, in turn causing you to burn more overall calories. Like I mentioned earlier, MPA KETOxygen is different from other exogenous ketone products. I combined precisely the perfect harmony of Focus and ?adaptogens? to mesh amazingly with the goBHB ketone salts. This equates to even better aerobic capacity, and even more prominent ?mental clarity and cognitive function. This isn’t your typical company throwing in a more than likely ineffective dusting of BHB salts (under 6 grams) into whey protein or a caffeinated pre-workout, this is a well-thought out and ultra potent exogenous ketone powerhouse! Most current reputable ketone supplements on the market yield a 10 -11 gram BHB salt potency. MPA KETOxygen gives you a whopping 12 grams per serving in conjunction with everything else.